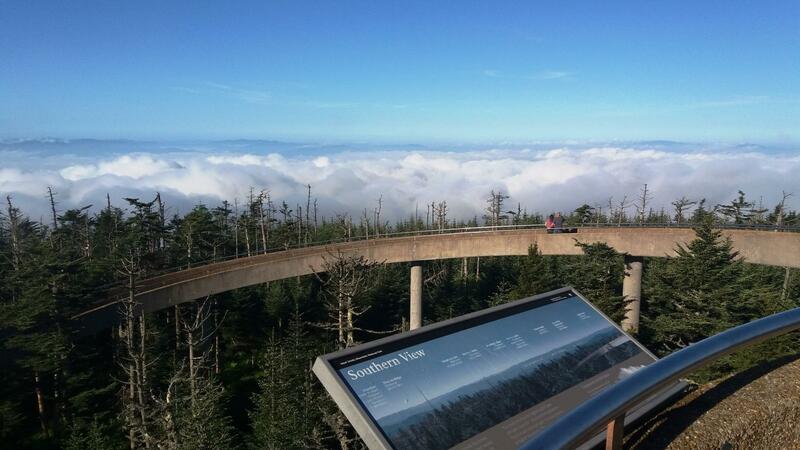 Cycling Clingmans Dome - the highest peak in the Great Smoky Mountains. Dome is the highest peak in the Great Smoky Mountains and Appalachian Trail. This is a great bike climb through beautiful scenery that only gets better the higher you go. The start of the climb is conveniently located at the Sugarland Visitor Center in the Great Smoky Mountains National Park (no entrance fee). The climb starts at a nice 3% grade for the first few miles before hitting 7% and staying between 4% and 8% for the next 15 miles. Clingmans Dome is on the Tennessee - North Carolina border. Clingmans Dome is in the Great Smoky Mountains National Park. The route is straightforward with the first 13 miles are on route 441. This section is on beautiful pavement but carries a lot of traffic with no shoulder. For perspective, I did this climb in early May on a weekday and was passed by a car every minutes. If you do this in the summer on a weekend, the traffic will make it almost impossible to enjoy this ride safely. After 13 miles on 441, turn right for Clingmans Dome for the next 7 miles which will take you all the way to the top. These 7 miles, which are also on great pavement, give you beautiful views of the park and carries about half as much traffic as route 441. Around mile 17.5, you will get a mile stretch that is flat to down which will give you a nice reprieve before tackling the final stretch of this climb. The top of Clingmans Dome has a large parking lot where visitors take a 1/2 mile trail to the circular dome that offers 360 degree views of all the surrounding mountain ranges. Please note this last 1/2 mile is a 10 foot wide walking path that has lots of people coming and going. Although I didn't see a sign that specifically said no bikes, the ranger said it isn't allowed as it would be impossible and down right unsafe to do this with all the foot traffic. If you want to do this last stretch, which is very steep (around 14%), you would need to do it very early in the morning or right before sunset. Cycling Clingmans Dome - this bike climb is, along with Mt. Mitchell in North Carolina, one of the two most popular bicycle climbs in the southeast. Other bike clims within a 25 mile straight-line radius of the start of this climb is Hwy 19 South - Waterrock Knob. Access this climb by clicking "Routes in Area" on button below or the climb card above right.